Leading the league with a sparkling 1.74 ERA, 25 wins, a .893 winning percentage, 9 shutouts, 248 strikeouts, and 6.15 hits allowed per 9 innings pitched. Holding batters to a .193 batting average, .249 on-base percentage, and .279 slugging percentage. His 9.6 wins above replacement that season has not been matched by a New York Yankees pitcher since then – and ranks as third all-time on the team. Guidry was named to the American League All-Star team and went on to win a second World Series that fall. Awards rightfully were showered on the man known as “Louisiana Lightning” and “Gator”. He won the AL Cy Young award and was named as The Sporting News AL Pitcher and Major League Player of the Year. By the time the Yankees came to Milwaukee to start a weekend series on Friday, July 7, Guidry had already racked up a 13-0 record. This included a masterful performance against the California Angels on June 18 in which he struck out 18 batters. No other Yankees pitcher has struck out that many batters in a game. At the time, Guidry fell just short of the MLB record of 19 strikeouts in a game shared by Steve Carlton, Nolan Ryan and Tom Seaver. The 4-0 shutout of the Angels also reportedly started the tradition of fans standing and cheering on the pitcher when he would get two strikes on a hitter. The 33,162 on hand at Yankee Stadium spontaneously rose every time Guidry got ahead of a hitter to back their hurler in finishing off the strikeout. The 40,216 fans that came out to County Stadium were excited to see a team that had been doing unheard of things, starting with being 10 games over .500 halfway through the season. The Brewers were rolling after a 21-9 June that featured a ten-game winning streak. They ended June and started July with a six-game winning streak before losing the next four in a row to Seattle and Minnesota. Milwaukee came into the series having won six out of seven games with the Yankees. The hitters were aware they would be facing a tough customer in Guidry, who threw a change up, fastball, plus had a sharp breaking slider that broke in on right-handed hitters. The 27-year-old Guidry came into the game with a 1.75 ERA and faced a fellow lefty in 29-year-old Mike Caldwell (9-5). Caldwell started the season in the bullpen and even had a save on April 11 against the Yankees. He moved into the starting rotation out of necessity when Moose Haas suffered a pulled elbow muscle. But once in the rotation, Caldwell proved how valuable he was and created a dominant 1-2 punch with Lary Sorensen. He didn’t back down from facing the tough Yankees lineup, or going up against the unbeaten Guidry. “All I could think of all week long is that he was as due to lose a game as anyone in the big leagues,” Caldwell said. Hisle put on a hitting clinic against Guidry. He tore into a down and in fastball in the first inning for a homer into the left field bleachers, scoring Don Money who doubled and Sal Bando who walked. He hit a second homer leading off the sixth – his 17th of the season, which tied him with Gorman Thomas for the team lead in round-trippers. Hisle’s four RBI’s put him at 54 for the season. The other Milwaukee scores happened when Sixto Lezcano led off the fourth inning with a double and scored on Robin Yount’s triple for a 4-0 lead. Lezcano knocked an eighth inning solo homer off reliever Bob Kammeyer for Milwaukee’s final tally in a 6-0 win. Gorman Thomas nicknamed Caldwell “Mr. Warmth” because the hurler had a grumpy disposition. Against the Yankees, he was business as usual and worked quickly, which led to the game coming in at just under two hours long. The Yankees had their best chance to score on Caldwell in the first inning before he completely locked in and routinely handled their potent lineup. Mickey Rivers led off the game with an infield single and went to second on a fielder’s choice. Thurman Munson drew a walk to put runners at first and second. Lou Piniella grounded to shortstop and Yount’s only play was to throw him out at first while the runners moved up to second and third. 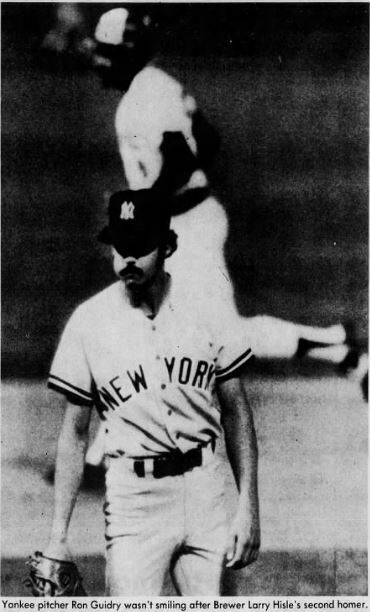 Caldwell induced Chris Chambliss into grounding to Money at first to end the inning. Caldwell then set down ten Yankees in a row before Chambliss singled with two outs in the top of the fourth inning. The other two hits were singles by Bucky Dent – to left field in the fifth inning and to center field in the eighth. Dent was left stranded at first in the fifth inning after Caldwell got Fred Stanley to fly out and then struck out Rivers. Stanley grounded into a double play to wipe out Dent in the eighth. The Yankees went quietly in the ninth. Roy White flew out to right and Munson and Piniella both grounded out to Sal Bando at third to end the game. Caldwell held the Yankees to four hits, walked one, and struck out four. His complete game was his 11th in 17 starts and the shutout lowered his ERA to 2.61. 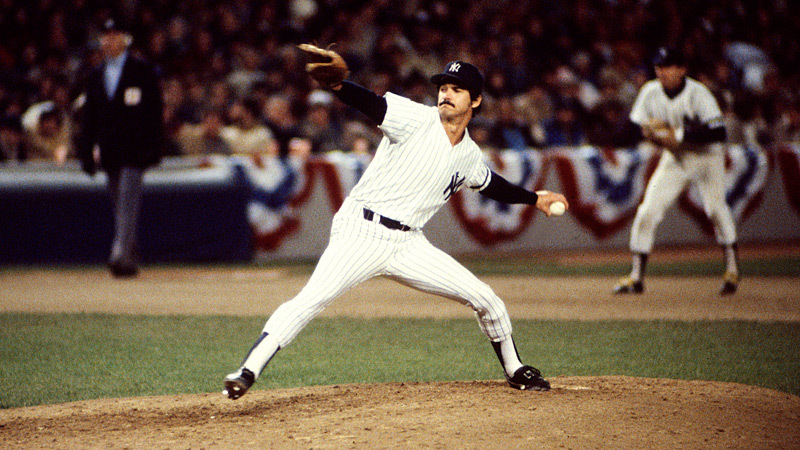 The Brewers proved that Ron Guidry was human – although in 1978 it became a prerequisite that to beat him, your pitcher needed to be lefthanded and named Mike. 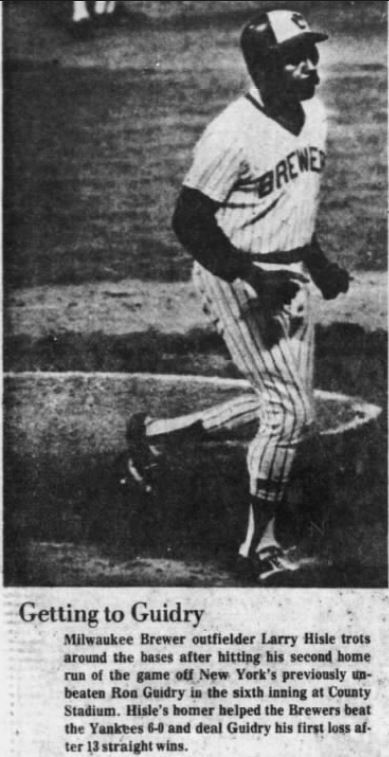 Guidry also lost 2-1 to the Baltimore Orioles and left-hander Mike Flanagan on August 4, and lost 8-1 to the Toronto Blue Jays and left-hander Mike Willis on September 20. Against Milwaukee, Guidry allowed eight hits in six innings and five runs. 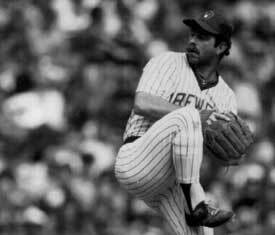 Every Brewers starter except center fielder Jim Wohlford had a hit with Lezcano and Hisle leading the way with two hits apiece. The win gave the Brewers (46-35) a half-game lead for second place over New York (46-36) in the AL East. Guidry hit the showers with three innings left to go in the game and didn’t speak to reporters afterward. One reporter questioned Yankees manager Billy Martin about why the league didn’t have a rule requiring players to make themselves available for questioning and this enraged Martin. 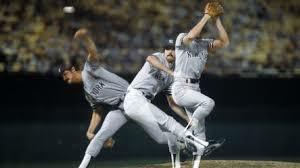 The next night Hisle again hit two homers – this time both came off relief ace Goose Gossage. The Brewers went on to sweep the three game weekend series. 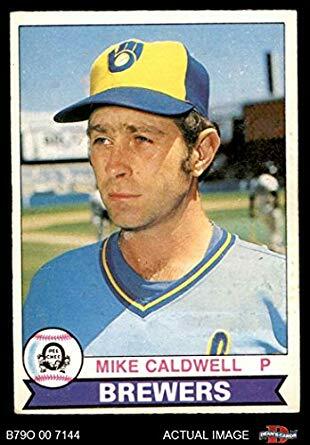 Caldwell became the second Brewers pitcher to win 20 games in a season when he finished with a 21-9 record. He went 12-4 after the game against Guidry and ended with a 2.36 ERA and a league leading 23 complete games. His 293.1 innings pitched were a career high – in comparison, Guidry pitched 273.2 innings. For his fantastic season, Caldwell was named the AL Comeback Player of the Year by The Sporting News and finished second in the Cy Young Award voting to Guidry. Guidry’s 13 wins to start a season are a Yankees record. The Brewers stopped him short of the league record of 15 set by Cleveland’s Johnny Allen in 1937 and equaled by Baltimore’s Dave McNally in 1969. The Brewers only faced Guidry one other time in 1978 – on August 10 in New York. Guidry tossed a three-hit complete game shutout and the Yankees offense beat up Jerry Augustine for an easy 9-0 win. Milwaukee beat New York in their season series 10 games to 5. 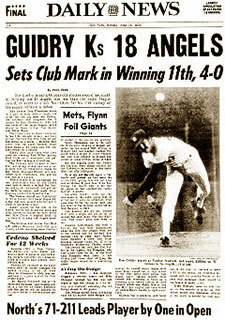 New York stormed to a World Series win over Los Angeles behind Guidry. His biggest win of the season was his 25th – he was the winning pitcher in the Yankees’ 5-4 win over the Boston Red Sox in a one-game playoff to determine the AL East champion.